At Ortho 101, we are proud to offer Invisalign® Teen to help straighten the smiles of older children and teens, using a series of clear, removable aligners. At Ortho 101, our orthodontist understands that teenagers want to feel good about their smiles. If you are a teen who is concerned about the aesthetics of metal braces, or a parent looking for orthodontic treatment options for your child, consider Invisalign® Teen for the convenience and practicality of removable, clear aligners. 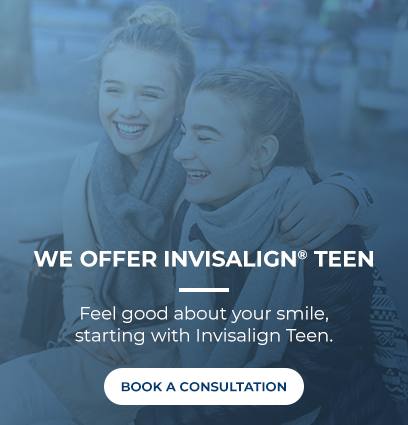 We encourage parents and teenagers who are interested in Invisalign Teen to consider the benefits associated with this orthodontic treatment option. You can continue to enjoy the things you love! Because Invisalign® Teen aligners are removable, there's no need to worry about hurting your mouth or breaking your aligners when participating in sports and other extracurriculars. What's more? You can also keep enjoying the foods you love! Invisalign® Teen uses a custom-made series of clear, comfortable aligners that your teen wears over their teeth. Every two weeks, your teen needs to pop in the next aligner set in their treatment plan. Over time, the teeth gradually shift into place revealing a straighter, functional and beautiful smile. Invisalign® Teen requires fewer visits to the orthodontist, so it's a great treatment option for busy families. It's recommended that the aligners are worn for 20-22 hours daily, and only removed for eating, drinking, brushing or flossing. Without brackets and wires, your teen can brush and floss properly. And we all know how important flossing is to maintaining oral health on our teen's smile!